Gas or electric powered chainsaws - which is best? With advances in modern technology arborists and woodcutters no longer need to simply rely on the 'old fasioned' gas powered chainsaw to fell trees or cut firewood. There are now three kinds of ways a chainsaw may be powered. As you might expect each kind of machine has benefits and weakness to their use. Let's consider the merits of each. If you're a Tim t'he Toolman' Taylor kind of tool user, you'll have a fond appreciation for devices that run on gas and give off a strong, powerful vibe. And gas or petrol powered chainsaws do just that. Gas driven engines can be configured to very high degrees of power output making them super useful for industrial work in the forest or simply being used intensively all day. A downside of using a gas driven engine is they do require a fair bit of maintenance. Many a user will often however take pride in undertaking correct maintenace of their chainsaw - especially when they can cost a small fortune! Electric chainsaws are a lot more quiet than gas. They don't have the same ooomph of the gas-powered cousins but they do have enough output power to light to medium duty jobs. Starting them is as simple as pulling the trigger. That itself has great appeal as starting a finicky gas-powered engine can be one of the most frustrating exercises there is! You know the drill, you just want to cut up the branch that has fallen on to your driveway but you then have to spend time, checking the fuel, checking the spark plug, making sure it has fuel! The utter drawback of an electric powered chainsaw is that you are only as mobile as your electric cable. 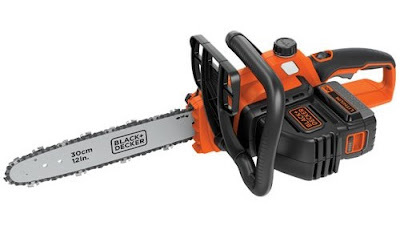 This is fine if you just want to use it around the house but you can't run off to the neighbors for a chainsaw chopping party with it! One also should bear in mind that the longer your cable, the lower the voltage supplied to the chainsaw, meaning its power output can drop. Another benefit is that giving they are fairly quiet, you will not annoy your neighbours so much as you would with an electric or battery powered chainsaw. A battery powered saw is a good option when you have to do a small amount of light to medium work such as pruning or cutting small trees. These things are obviously battery powered and won't last all day. They are however very easy to use, clean and are quite portable. If you only have the one battery, you will be limited by the amount of work you can get done as you'll obviously need to recharge it when empty meaning downtime for you.